Four scheduled shows in Montreal by French comedian Dieudonne M’Bala M’Bala, whose act routinely includes Holocaust denial, praise for Adolf Hitler, Nazi salutes, slurs against the Talmud and other anti-Semitic language, were cancelled last week by Quebec’s largest concert promoter. The cancelled shows were part of Dieudonne’s first attempt to seriously promote his first feature film L’Antisémite, released earlier this year, in North America. The film, reportedly funded in part by the Iranian government, makes no attempt to conceal its message. The film’s trailer shows Dieudonne declaring, “It’s clear the Jews control everything — media, finance, politics. We no longer have a choice,” before arriving to the apparent punch line, “we must exterminate them.” Another short clip from the film mocks the discovery of the gas chambers at Auschwitz, suggesting that they were a fabrication. Dieudonne has been the subject of much controversy in Europe where he has been convicted of inciting hatred in France and is under investigation in Belgium for “inciting racial hatred and xenophobia” during a performance earlier this year. Additionally, Belgian authorities recently forced Dieudonne to cancel two shows in Brussels, and French police stopped Dieudonne mid-performance on May 9 for breaking local defamation laws. 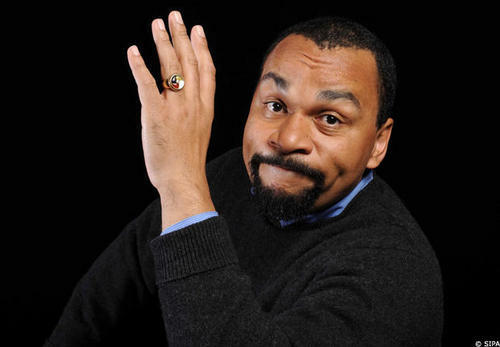 In addition to his performances, Dieudonne makes his views known outside the context of his supposed comedy, including running for the European Parliament in 2009 with the Parti Anti Sioniste (the Anti-Zionist Party), which received 1.3% of the vote. According to the party’s website, its primary goals are to remove the “Zionist intervention” from the public affairs of France, denounce all politicians who advocate for Zionism, and to eradicate all forms of Zionism from France. In April 2010, Dieudonne was interviewed on Iran’s English-language propaganda television station Press TV, where he claimed that Zionism has organized “all the wars and disorders on the planet.” He also argued that the stock market and the unemployment that resulted from its crash are part of the “Zionist project” and that Zionists manipulate the film industry using movies as Jewish propaganda. this guy is not funny! how is "exterminate them" a punchline? how is "exterminate them" a punch line?